We won! This action is now complete as numerous California Republicans broke with Mr. Norquist and supported the "fiscal cliff" deal. A few prominent national Republicans are finally waking up. As the “Fiscal Showdown” heads into its last few weeks, they’ve realized they were elected to serve their constituents, not Grover Norquist -- the infamous anti-tax lobbyist. Will California's GOP representatives follow their lead? Nearly 60% of California voters backed President Obama and nearly 55% backed Prop. 30, mandating that the top 2% should pay a little more in taxes to build a better society for everyone. We have yet to find out if our GOP representatives heard the message. 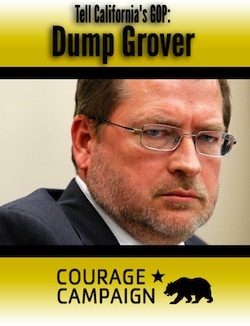 Sign our petition: Dear California's GOP representatives, please reflect the will of Californians and publicly state that you are open to tax increases to help solve our nation's problems, regardless of your pledge to Grover Norquist.